What Does "Sterling" Mean in Sterling Silver? We hear and see "sterling silver this" and "sterling silver that" almost every day, yet many shoppers do not understand what it really means. Does "sterling" mean "pure"? Does sterling silver jewelry come from a certain part of the world? Is sterling better or worse - or the same - as pure silver? And what does that stamp on the back of my necklace mean when it says ".925"? By definition and international agreement "sterling" silver is 92.5% pure silver and 7.5% some other material - usually copper. The 92.5% is why jewelry is often stamped with the numbers 925 or .925. Now you might think, "oh, well that means sterling silver is not as good as pure silver". Well, yes and no. It certainly isn't pure, but sterling silver is mixed to this exact ratio for some very good reasons. Have you ever seen pure silver after a few years in the open air? If not, take a look at your grandmother's silver spoon collection. Silver tends to oxidize (tarnish) quickly, leaving it a yucky brown color. The 7.5% copper or other metals used to make sterling silver slow down the tarnishing process. Secondly, pure silver is a very soft metal. It can bend or break easily. Adding another, more durable, metal to the mix ensures that your silver jewelry will last a lot longer, and look a lot nicer down the road. 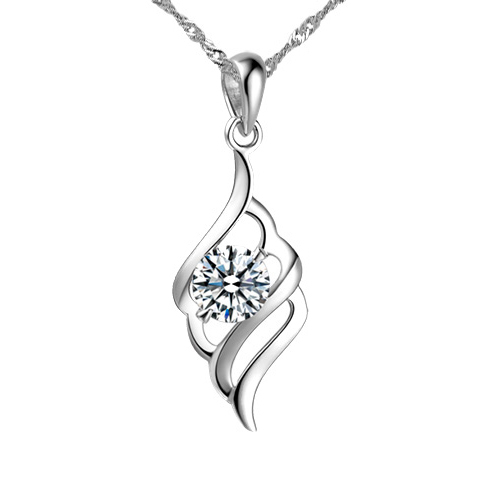 So really, sterling silver - although not pure - is usually the better option when choosing jewelry. And last but not least, adding another metal - and thus making the silver more durable - makes the substance easier for metal-smiths, jewelers and craftsmen to handle and manipulate into those intricate rings, pendants and necklaces we so adore.